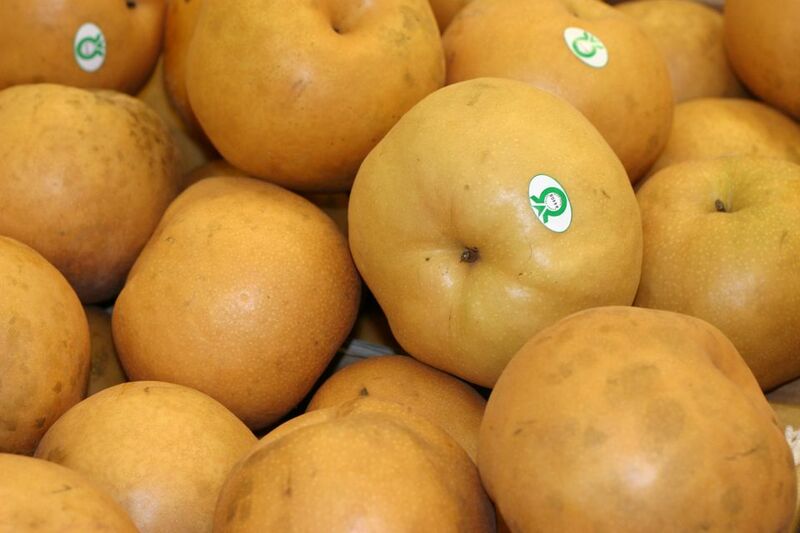 A Korean pear is a large round fruit that is eaten raw or used as a sweetener in sauces and marinades. Koreans call the fruit they know as “bae” a Korean pear in English. They grow on trees of the species Pyrus pyrifolia, which has beautiful blossoms in spring. This fruit is also sometimes called Nashi apple, apple pear, Asian pear, Japanese pear, Chinese pear, sand pear, and bapple, arguably the cutest name for the fruit. In many neighborhood grocery stores, Korean pears are usually labeled as apple pears. But the fruit is not, as some of these names might suggest, a hybrid between an apple and a pear. It's a good descriptive name, though, as their round shape, crunchiness, and texture do resemble that of an apple. Like apples, Asian pears taste best when they ripen on the tree and are ready to eat as soon as they are harvested. That means no waiting for this fruit to be ready for consumption, which is the case for so many others. In fact, they do not soften and get sweeter as Western pears do, so you do not have to delay eating them at all. Asian pears are hard, crisp, sweet, slightly tart at the core and very juicy. Because of their high water content, which makes them low calorie, they are not cooked into pies or preserved into jams or jellies. In the Korean home, they are peeled and enjoyed raw as a dessert or a snack, are eaten raw in salads and used as a sweetener in the cooking and marinating process. They have a grainier texture than Western bosc pears and are not as mushy. If you wonder what to do with a large Korean pear, the easiest answer is to do what Koreans do and simply eat it raw as a dessert. Growing Asian pears can be labor intensive, and the fruit is bruised easily from rough handling, packing, or picking, so they need to be packed with individual padding or in soft trays like eggs. Because of this, these pears can be quite expensive and, among Koreans and other East Asians, are given as gifts or served to guests. Many people are excited to receive this delicious and healthful treat. You may want to follow this tradition rather than giving sugar-laden candies or chocolates. Asian pears range in color from green to yellow to brown. When you are buying them, try to find fragrant and firm fruit with little or no bruises on the skin. Simply put, pick the fruit that looks the most appealing to you. If it is mushy and brown, you likely won't choose those pears to bring home. Once you select your fruit, however, know that the pears keep well and can last for a couple of weeks in a cool, dry place or for a few months in the refrigerator.